Marina Krakovsky is a business journalist and speaker based in Silicon Valley. Her most recent book is The Middleman Economy: How Brokers, Agents, Dealers, and Everyday Matchmakers Create Value and Profit. Ms. Krakovsky can be reached at marina@marinakrakovsky.com. When Rachael Sobon, SHRM-CP, started her job as the first human resources (HR) professional at CRP Industries 10 years ago, she quickly saw room for improvement. Sobon understood that the daily deadlines of a bustling warehouse required many of the Cranbury, New Jersey–based company’s 180 workers to be onsite at certain hours. However, she also believed that some policies at CRP, a third-generation family business that distributes after-market auto parts, were too rigid for the company’s own good. “We had a lot of attendance issues,” Sobon recalls. Because there was no provision for taking just an hour or 2 off at a time, employees would often take a sick day to run errands or go to routine appointments. Many would use up their time off by summer, so when the holidays rolled around, they took leave without pay. “That hurts the business when we can’t schedule out the manpower,” Sobon says. Decades-old policies intended to ensure proper staffing levels were backfiring, Sobon says. So, with support of the company’s President, she introduced a paid-time-off policy that allows employees to take accrued leave in half-hour increments. “Whether they’re sick or going to a school play or the cable person is coming—it just gives them flexibility so they’re not stuck in a situation where they have to pretend they’re ill or make up a story,” she explains. Sobon also rolled out an option for employees to work a compressed, 4-day schedule in the summer and take part in staggered work shifts starting between 6:30 and 9:00 a.m., depending on the requirements of the job. And because workers are cross-trained in all the warehouse positions, they can move from one role to another as needed. Over the past decade, the drumbeat has been growing louder for more flexibility in the U.S. workplace. Driven by demand from Millennials—who now represent the largest generation in the labor force—many employers are offering a range of scheduling options to attract and retain top talent in a competitive employment market. According to the Families and Work Institute’s (FWI’s) 2014 National Study of Employers, more than 80% of employers with at least 50 workers allowed at least some employees to take paid time off for personal and family needs or to periodically change when they start and end the workday. Yet experts say there’s a gap between companies’ stated policies and their willingness to embrace flexibility in practice, particularly for individuals in blue-collar occupations—jobs that often involve manual labor and tend to pay by the hour. 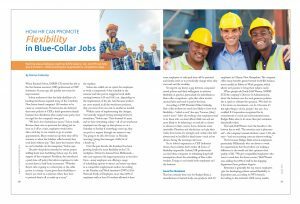 According to FWI President Ellen Galinsky, blue-collar workers are much less likely to have such flexibility—“which is sad,” she says, “because [they] need it most.” After all, working-class employees tend to be those who can least afford child care and are more likely to be balancing a second job or classes to advance in their careers. Some obstacles seem inevitable: Plumbers and electricians can’t ply their trades from home, for example, and certain roles will always need to be filled at fixed times—such as bus drivers during the morning rush hour. Yet as Sobon’s experience at CRP Industries shows, those realities don’t render all forms of flexibility impossible. Indeed, HR professionals can lead their companies in rethinking long-held assumptions about the scheduling of blue-collar workers. Doing so can benefit both employees and the business. That has certainly been true for Badger Balm, a manufacturer of natural body care products with 90 employees in Gilsum, New Hampshire. The company offers many benefits geared toward work/life balance, most notably its Babies at Work program, which allows new parents to bring their infants onsite. When people ask Emily Hall Warren, SHRM-SCP, the company’s Director of Administration, about the business case for such generous policies, she is quick to reframe the question. “We don’t do it for return on investment—we do it because it’s the right thing to do for people,” she says. As a certified B Corporation recognized for its ommitment to social and environmental issues, Badger Balm aims to do more than just maximize shareholder value. That’s because Badger Balm attracts employees, particularly Millennials, who are driven to work for organizations that they believe are making a difference in the world and that optimize their quality of life. “We get overqualified employees who want to work here for those reasons,” Hall Warren says, adding that 20% of staff in the shipping department have graduate degrees. Allowing employees some degree of control over their schedules can also reduce unplanned absences, as the managers of Globe Firefighter Suits discovered 9 years ago. That’s when the 430-employee manufacturer of emergency response uniforms gave its workers flexibility in their start times. But how can you keep an assembly line moving if some people start at 6:00 a.m. and others don’t arrive until 2 hours later? Most employees at Globe still opt to start at 6:00 a.m. so they can finish by 2:30 p.m.—in time to meet the school bus or tend to other responsibilities or just enjoy more free time during the day. But being given a choice is a big morale booster, and the workers are happier overall and less likely to quit than they were before. The company also offers a flexible time-off policy that has decreased absenteeism. At Softstar Shoes, a maker of handcrafted “minimal footwear” based in Philomath, Oregon, at least one-third of the 28 employees work part time. The company offers flexible start times and leeway to leave in the middle of the day—major selling points in attracting workers, many of whom have hobbies or side businesses in other crafts, says HR Manager Sarah Mason. “When I hire people, I tell them that, although they will never become millionaires working here, one of the biggest benefits is the flexibility that comes with the job, and also loving your work,” she says. So why haven’t more employers with blue-collar workers adopted such policies? In many cases, they simply haven’t needed to. Companies are generally most willing to integrate flexibility options for occupations where there is a labor shortage, according to the research of Ellen Kossek, a Professor of Management at Purdue University’s Krannert School of Management. Although there will always be a cost to hiring new employees, going the extra mile to retain workers becomes more important when there isn’t a long line of applicants ready to replace them. “That’s why you see more experimentation in nursing than construction—because of the shortage of workers in nursing,” Kossek says. Meanwhile, income pressures induce workers to put in more hours than they might otherwise prefer, says Peter Berg, a Professor at Michigan State University’s School of Human Resources and Labor Relations. “If blue-collar workers find that their wages have been stagnant for the last several years”—as, in fact, they have been—“that makes it more valuable to take the hours and work Saturday or Sunday,” earning time and a half on top of 40 hours of straight-time pay. Unfortunately, however, employees often don’t have a choice, particularly in non-union jobs, as the employer can mandate extra hours. “When the boss says, ‘I need you to stay on for the next shift,’ that’s a real schedule flexibility killer,” Berg says. Even in union shops, where collective bargaining gives workers some clout, work/life balance and flexibility might take a back seat to other issues deemed more important in union negotiations with management, like wages and health benefits, Berg points out. And advances in scheduling software have generally not been a friend to workers, especially in the retail and service industries. Store and restaurant managers have always tried to control labor costs by staffing up or down to match the peaks and valleys of customer demand. “But now there’s technology that lets retailers look at minute changes in demand and make adjustments much closer to that time than they have in the past,” explains Susan Lambert, a Professor at the University of Chicago’s School of Social Service Administration who studies people working in low-skilled, hourly jobs. “Variations in work hours in hourly jobs look very much like instability rather than flexibility,” she explains. Moreover, employees must balance any freedom they have to turn down shifts against their need to make a living wage. “If you say you can’t work Tuesday afternoons, you’re not scheduled for that time—but that doesn’t mean you will be scheduled for when you can work,” Lambert says. The result can be a system that pits workers who can be available at a moment’s notice against those who need more flexibility. “People with outside responsibilities—students, people with children—are at a loss in this competition for hours,” she concludes. HR professionals are in a good position to find flexible solutions that meet the needs of both employers and workers. A good place to start is by auditing your company’s scheduling practices, which can reveal startling gaps between written policies and reality. For example, when are schedules published for employees to view? How much do hours vary week to week? What percentage of workers want more hours, and what proportion work different hours and days each week? “Corporate people are often quite shocked to know how unstable and unpredictable the jobs are,” Lambert says. One reason for the disconnect between what’s on paper versus what’s being practiced is that companies typically put far more effort into writing policies than in implementing them. For example, Berg says most supervisors he has interviewed have received no training on how to manage issues related to work/life balance. As a result, they don’t know what options they can offer to employees in different situations. By providing tools for implementing flexibility, HR can help managers deliver on the company’s good intentions, communicating to employees that the organization genuinely cares. One large retailer that does seem to have figured it out is The Container Store, based in Coppell, Texas, which last year secured the No. 14 spot on Fortune’s list of 100 Best Companies to Work For. All of its 5,000 employees nationwide, including the many part-time workers at the company’s 86 stores, receive at least 30 hours of training—not just on the nuts and bolts of their jobs but also on the company’s “employee first” culture, which prizes communication, says Karyn Alvarez, Director of Recruiting. Clear communication starts during hiring. Managers are upfront about current business needs, and prospective employees share their needs and hopes. When you have that 2-way conversation, “there’s not a lot of surprises after the fact,” Alvarez says. As workers’ lives change, managers keep the lines of communication open and work to accommodate employees’ scheduling needs as much as possible. “Maybe they’re a student in college, and one semester they have all morning classes and they ask their manager to work afternoons or evenings, and then next semester it flip-flops,” Alvarez says. The supervisor is receptive to the request because she knows it’s coming from a good employee in whom the company has much invested. This kind of give-and-take suggests that The Container Store has at least one quality that Kossek and her colleagues have identified in organizations that implement flexibility initiatives effectively: Employees feel that the organization supports their personal lives. The company uses Kronos—the same software that some companies use to generate crazy-making schedules—but leverages the technology to plan workers’ timetables several weeks out, matching projected sales with who is available to work when. It also pays its hourly employees 50% more than the retail industry average. Reprinted from Society for Human Resource Management, March 20, 2017, with permission of the Society for Human Resource Management (SHRM). ©SHRM 2017. All rights reserved. This article was published in the July 2017 issue of Insulation Outlook magazine. Copyright © 2017 National Insulation Association. All rights reserved. The contents of this website and Insulation Outlook magazine may not be reproduced in any means, in whole or in part, without the prior written permission of the publisher and NIA. Any unauthorized duplication is strictly prohibited and would violate NIA’s copyright and may violate other copyright agreements that NIA has with authors and partners. Contact publisher@insulation.org to reprint or reproduce this content.